A common question on many Lotus-related discussion groups is "I am buying an Elise - what do I need to look for?" This Buyer's Guide will help you understand what to look for, how to find it and what impact it should have on your buying decision. This guide is free and relies on information contributed by many people. If you know something about the Elise, you are encouraged to write a contribution for this guide. This guide does not have "for sale" advertisments. See below for links to sites with cars for sale. This page requires a sytlesheet-enabled browser to look its best but everything still works without the stylesheets. You are using I have not tested this script for your browser. Please email me if you find a problem. You can add your own ideas to the Buyer's Guide list. Accident damage to the chassis has the most significant impact on the value of an Elise. Because so many things are permanently bonded to the chassis, replacing it is like swapping your old engine and seats into a new car. It only takes a few minutes to check, if you have access to a panel beater's flat reference plane. Take the car to a panel beater's shop (body shop.) Get them to check that the chassis is not twisted. When measuring each of the four corners (at "tooling holes" between the suspension arms) no corner should be more than 2mm above or below the others. This kind of damage is usually unrepairable. Accident damage to the suspension is very common and not always very well-repaired. Usually the suspension arms will be bent but ball joints, track rods, shock absorbers and the anti-roll bar can also be damaged and overlooked when repairing. Check straightness of all suspension arms. A much better inspection can be made if you can remove the wheels. 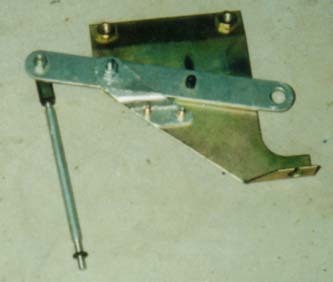 The accelerator linkage under the dash uses a 4mm bolt as a pivot. Despite the nylon locknut, the bolt will come loose and the linkage will develop slack so that full throttle can no longer be achieved. This is very easy to fix and it's free horsepower. Press on accelerator while the engine is running. If there is any movement of the pedal before the engine responds, then the pivot bolt is certainly loose. If this has been left for a long time, the bolt will be damaged. Remove and replace with a new one. You will need a 7mm spanner (or shifter), a phillips-head screwdriver and about 15 minutes in the "Lotus position" on your back, under the dash. If the boot-release cable is so stiff that you have to push the handle back in to make it lock, then it is time to replace the cable. A standard aftermarket bonnet-release cable (about 2 - 3 metres long) from any auto parts store will do the job. You don't have to buy the Lotus part. Installing it takes a bit of time - pulling the speaker trim panel out is the hardest part. The steering rack on some Elises ingests dust and wears out the ball joints and rack very quickly. Early cars did not have the rubber boots sealed properly, which contributed to the problem. <P>If it's the ball joints, then the front wheels will move independantly. If it's the rack that's worn then the slop will be worst in the straight-ahead position and will be the same for both road wheels. <P>This problem seriously reduces the drving pleasure. With the wheels in the straight-ahead position, waggle the steering wheel and observe the front wheels turn. If the steering wheel moves even 1mm without moving the road wheels, the rack is due for overhaul. The standard Lotus exhaust is made of (heavy) mild steel. It will rust within a few years and leave unsightly dribbles on the bodywork. Stainless steel upgraded exhausts are very common and sound much better. While looking at the exhaust, check the condition of the exhaust mounts. Are the outlet pipes central in their aperture? By removing one rear wheel you can inspect the condition of the mounts for the catalysic converter and muffler. Does the car have the original rusty steel exhaust? Take one rear wheel off and look closely at the rubber mounting blocks supporting the catalytic converter and muffler. Accident damage to the rear clamshell is easy to spot in models that have the "boot bag" instead of the moulded-in box. Fibreglass patches will be very visible. If it is good quality work (no air bubbles or straggly strands) then there is nothing to worry about. It will be as strong as the original body. Pull the boot bag away from the rear of the boot opening and look at the inside of the rear clamshell. The interior of the Elise seems to wear faster than other cars. The pedals will always be worn on one side. The pad on the driver's side chassis rail will be worn through at the point under the driver's elbow. The important thing to watch out for is marks/scratches/dings on the chassis. They will not "polish out." The Lotus "diamond coating" is damaged and cannot be repaired. Check interior of car for wear & tear. Pay particular attention to the areas of exposed chassis. Marks in the aluminium will not polish out. I think the answer is to treat the interior as a consumable (like tyres) to be replaced every few years. The K16 engine is famous for leaking oil in its LandRover Freelander installation. It is not known to have any chronic leaks when installed in an Elise. While looking for coolant leaks on the undertray, look for oil smudges too. Colant leaks should be rare because the significant one (a leak from the inlet manifold gasket) should have been fixed on every car under warranty. Radiator hoses are known to come off, but that is also rare. Have the coolant system pressure-tested if possible. While you have one reare wheel off, look for tell-tale puddles on the undertray under the engine. Somehow the paint used by Lotus on the Eilse seems to chip more easily than other paint. Even though they changed from mineral-based to water-based paint early in the S1 production run, all owners complain of this. Stone chips on the front bodywork are unavoidable. Is this one you're looking at worse than others? Well, now that you've read all that, you probably want to go looking for an Elise to buy. My Elise Links Page has links to for-sale sites, discussion boards and general Elise information. Don't forget to look at Yvo Tuk's Dutch site, with a very detailed buyer's guide in a different style.